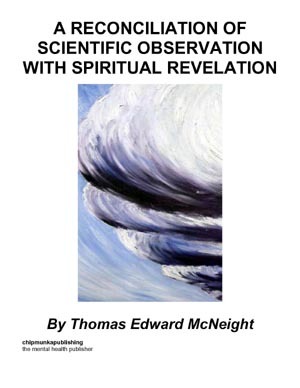 ‘A Reconciliation of Scientific Observation with Spiritual Revelation’ is my latest book dealing with issues of a philosophical as well as of a spiritual nature, using as its backdrop the spectre of mental illness and the way that many sufferers from mental disorders are treated these days. I have tried, in this short piece of writing, to elucidate concerns regarding truth and reality that continue to vex me, as well as highlighting the plight of the mentally ill, showing, I hope, the harshness with which those people are treated by the community at large. Thomas Edward McNeight is a published author on issues concerning mental health. He uses as his background his studies in philosophy with the university. He lives in Whanganui, New Zealand, occupying himself with writing and painting, as well as acquainting himself with his friends who also have emotional problems and are only too aware of the persecution that is so prevalent in today’s world regarding people who do not seem to be able to fit in, in the society to which they supposedly belong. I would, in no doubt, by most peoples standards, be accused of being contentious or of being disruptive even, if I were to state quite boldly that I believed that the three most important things in the cosmos were life, love, and laughter, in that order. I make this claim on the grounds, that I, for one, hold in very high regard my capacity for laughter. I am sure there are many of you out there, who may know of my convulsions of helpless mirth, my hysterics of unbridled hilarity, who would beg to differ. Not one for being disposed to any pretensions of wayward frivolity, nor to any such notion of a spiritual, or even of a scientific nature, I could, still, quite candidly maintain that a life led without laughter or love is no life at all. Obsequious behaviour on the part of these perpetually perplexed over what there is to laugh about, let alone love, in this god-forsaken place, speaks for itself. I am not ashamed of anything I have done. I am proud to be what I am. If I were to stand up and laugh out loud, then that is what I shall do. To hell with ‘em. Let them drug me up with more chemicals. Let them lock me up in the psych ward. I am attempting, in this book, to reconcile the notion of physicality with that of spirituality. Who is right? The scientist or God? Who cares? Well, I for one do, very much. Spitting tacks at those who call the shots, will only lead to a sore mouth (or a trip to the doctor or the psychiatrist). Be that as it may, allow me, if you will, to assert, initially, that as the conundrums that we all encounter are of little concern to me when I am out on the beach, feeling the waves splash around me, feeling the sun blaze down, watching those white clouds march across the sky. Such is the intensity of these times that these questions that I am asking in this book seem to fade somewhat. Sure enough, one cannot spend all day catching fish. If one did one would die of boredom surely. So what is the point of this exercise? Basically, because I would rather be doing something than nothing. I am a psychiatric patient. I am heavily medicated. I have a thoughtful disposition. I like to dwell on serious issues. This is how I am. So I have decided to write this book. It is, I hope, a means by which I can release some of my pent up anger at the world which I contend, is not, by a long chalk, how most of us see it as being. So how do we view the world? What do we make of it? Do we base our apprehension of it on spiritual revelation or scientific observation? Are we materialists, or are we spiritualists? Out of the furnace of conflicting arguments regarding these issues there has arisen a maelstrom of furiously debated points of view, none of which I am familiar with. I am merely a layman, a man on the street. But I have a brain. And I have a mind. I am a thinker. I will, in the following pages, hopefully, enlighten you somewhat on how we, the downtrodden, the oppressed, the loonies, the nutters of the world see things. This is my book. This is what I will do. In this book. When I was quite a bit younger, I was quite active in the spheres of climbing, parachuting, bungy jumping, fishing, and so I found myself on several occasions, face to face with death. Whether the situation arose on a rock face high up in the mountains or whilst leaping out of planes, or off a bridge, I confronted death. I make no bones about that. I also confronted my fear of death. A fear which most of us would readily contend to be the greatest of all fears. It is a hard ugly feeling one has, as one is getting to grips with the thought that one may not survive the next few minutes, or seconds. This is how it is, to confront death. It is a hard, ugly, grey feeling. There is no beauty or glory in it. One is looking at death in the face. One does not feel brave or heroic or anything like that. One feels, if anything, like a coward. At least, that is how I felt. I was very scared. But I went on ahead. And I continued climbing up the rock face and I managed to parachute out of the sky to a safe landing. That is how it was. I am not writing this to show my true colours. I am merely trying to highlight the sort of issues we all deep down have to confront at some time in our lives. These issues involving life and death. Life confronting death. Life meeting death head on, are, I believe, very deep spiritual issues. I shall here, in these pages ahead, attempt to make some sort of sense out of them.